Need a car in London? 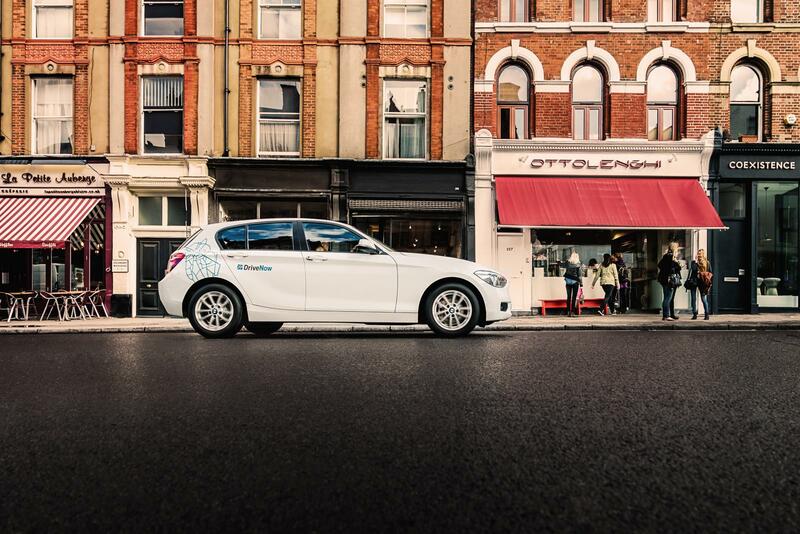 DriveNow is your flexible car club, giving you 24/7 access to BMW and MINI vehicles conveniently located across London. Find a car through the app and drive by the minute, hour or day with fuel, parking and insurance included. Find it, drive it and drop it with DriveNow. Going out for dinner with friends, heading to a meeting across town, or off on a spontaneous weekend adventure? Our BMW and MINI vehicles are available on demand 24/7 - there's no need to reserve a car days in advance. Just jump in a car and drive off! At the end of your journey, simply leave the car for free in virtually any public on-street parking bay within the DriveNow Zone. Choose to drive by the minute, or book an hourly or daily package if you need the car for longer. Everything's included in the rental price - insurance, fuel, parking, road tax, and the rental of a premium BMW or MINI. Plus there are no annual or monthly fees - just pay when you use DriveNow. See all Pricing and Packages. DriveNow's car sharing service is available in Westminster, Tower Hamlets, Southwark, Barnet, Brent, Islington, Hackney, Haringey and southern Waltham Forest. Escape the city in a MINI Convertible, take an all-electric BMW i3 for journeys into the Congestion Charge Zone, or fit all your shopping bags in a BMW 1 Series. There's a DriveNow car club vehicle for any occasion and we aim to ensure one of our 700+ cars is never more than 5 minutes away in the London DriveNow Zone - find the nearest car in the app today! Where to find rental cars and park them? The London DriveNow Zone currently covers Islington, Hackney, Haringey and southern Waltham Forest. Find a car in the DriveNow app which shows the vehicle locations, various models, emission type, fuel/charge level and any special price offers. The cars won't often be parked in the same place as they are driven and moved by other members of the DriveNow community. Reserve the car you want in the app, pre-plan your journey, unlock with the app and off you go! You must start and end your rental in the DriveNow Zone, but you can drive where you want during it. When ending your rental or parking temporarily in the DriveNow Zone, you can park the car for free in any residents', pay and display or public parking bay. Outside of the DriveNow Zone, you will need to follow the instructions on the parking sign, including purchasing a parking ticket, as you do when driving your own vehicle. With Drive'n Fly at London City Airport you can pick up and drop off your DriveNow BMW or MINI in the dedicated DriveNow bays in Terminal parking - less than 5 minutes walk from the terminal building. Simply grab yourself a car and drive to London City Airport, or next time you land, reserve a car using the DriveNow app while waiting at baggage claim. Then jump in your reserved car and head home fresh and relaxed. There's no need for a parking ticket, just a small £2.50 DriveNow pick up or drop off fee.